There is a wonderful saying “What got you here, won’t take you to next level”, you need to keep enhancing your skills, keep innovating yourself by breaking old habits. a)	Start with your own Pain points: The easiest and straightforward way to create a great product or service is to make something you want to use yourself. 06 Aug Start a business & not a startup !!! Recently one of the networking events wherein I was participating, started with a discussion about self-development and how one can remain on the continuous learning curve. Few insights came out and helped me re-discover my Eureka moment. 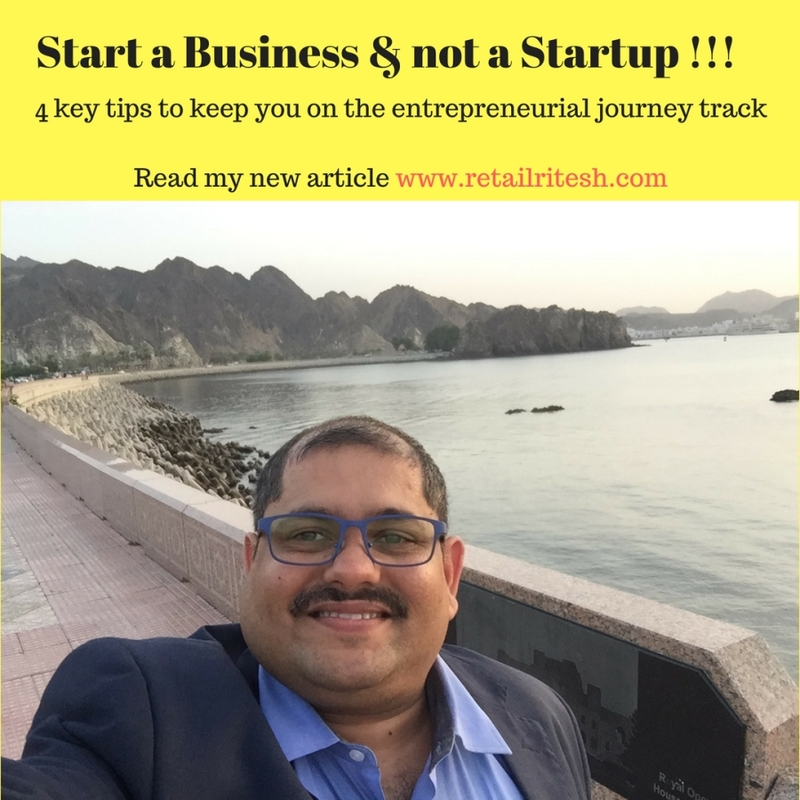 My inspiration to write this article comes from the current course which myself and my wife are pursuing which is all about nurturing entrepreneurial drive and believing your core dream and finding purpose. Thanks to my teachers & mentors for providing me with insights and changing my thought process during the course of my learning classes. I am going to list down my few learnings which are my own point of view and some of you may or may not agree with my point of views but one thing is sure that it would help all budding young aspirants who want to take up entrepreneurship. Start with your own Pain points: The easiest and straightforward way to create a great product or service is to make something you want to use yourself. As you start building the project, you would soon figure out yourself whether or not you are making any good. Case study: Coach Bill Bowerman felt the need for better lighter running shoes for his team. So he went out to his workshop and poured rubber into the family waffle iron. That’s how Nike’s famous waffle sole was born. Key learning: “Start with your own pain point” and coming out with the solution, lets you fall in love with what you are making. This very source provides you inner-motivation and go-getter attitude. 2. Keep customer focus through-out: Always at the start of any project, keep your customer on focus, imagine what you would like your customer to say about your product or service. 3. Be Action taker: You should feel urgency about whatever you are planning to start or to do. If you are building a break-through product or service or even Me-Too product, JUST DO IT (as Nike says it). Don’t sit around and waiting for someone to make the difference that you would like to see. Case study: The Drudge report, run by Matt drudge is just one page on the web run by one guy. Yet it has a huge impact on the news industry- television, radio talk-show hosts, and newspapers journalists all visit this page daily to find out as to what’s the current stories. In July 2016 during US Presidential elections, the site garnered 1.47 billion Pageviews. The Drudge Report’s traffic beat out the likes of news sites from Disney Media Networks (which includes ESPN.com and ABCNews.com), Yahoo, Google, Time Warner and Fox Entertainment Groups. Key learning: Make the difference that you would like to see yourself. These disruptors (the drudge report) came from nowhere and destroyed the old models that had been around for decades. Case study: Wholefoods (now a part of amazon.com) stands for selling the highest quality natural and organic products available. Their customers knows and understands Wholefoods purpose, they don’t go to their stores asking or looking for potato chips or coke or junk food. This very “WHY” adds rock solid positioning for wholefoods and is one of the reason for their success. I shall be writing more about entrepreneurship and management leadership stance in my upcoming articles. I hope you would find these tips or pointers useful in your journey. Incase if any of my readers or linkedin connections want any help pertaining their startup ideation, you are more than welcome to reach out to me at riteshmohan@yahoo.com. Sir,Very useful & encouraging article. Thanks so much for sharing your email id. We will send you our couple of Innovations. I am glad you liked it Nilesh.